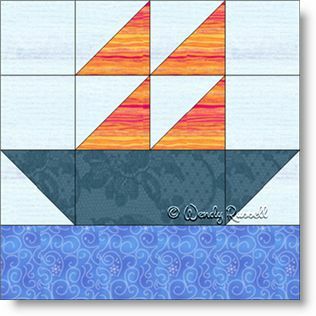 For those of you looking to make a quilt for that little boy in your life -- look no further than the Little Boat quilt block. This simple block can allow you to use up some of that fabric stash you have been hoarding -- (oops, I must be speaking about myself, as I have a huge fabric stash!). Lots of colourful sails made using half square triangles can make this a really special quilt for that young man in your life. The sample quilts illustrated feature a scrappy version and a quilt with extra blank blocks to show off your quilting skills. Let the fun begin!